Technicolor (Higgsless). In theory, electroweak symmetry can be broken without a presence of a narrow spin-0 resonance in the spectrum. Concrete realizations of that idea have long had a hard time to survive the constraints from flavor physics and electroweak precision tests, nevertheless until the last year this was a viable alternative to the Higgs boson. Alas, the observation of the Higgs boson signal at the LHC and Tevatron dealt the last blow to this cute branch of particle theory. Technicolor being dead does not mean that strong interactions cannot play any role in electroweak symmetry breaking. However any such theory should give a rise to a light spin-0 composite state with similar properties as the standard Higgs boson and an order of magnitude lighter than other resonances -- a non-trivial and difficult constraint. 4th generation. The Standard Model contains 3 generations of quarks and leptons with identical quantum numbers and identical couplings except for the couplings to the Higgs field. A priori, there is no reason why there could not be yet another heavier copy, the so-called 4th generation. Yet there isn't. In this case the death was also foretold by the long-standing tension with electroweak precision tests, but again the final blow came from the Higgs searches. 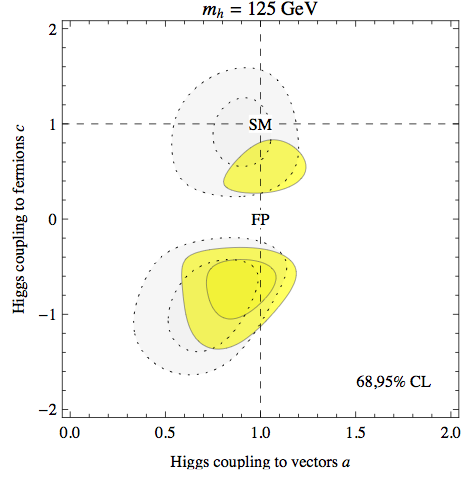 The new quarks of the 4th generation would contribute to the gluon fusion amplitude of the Higgs production, leading to a dramatic increase of the Higgs production rate. At the same time, due to accidental cancellations, the amplitude of the Higgs decay into 2 photons would be largely suppressed compared to the Standard Model. Thus, the prediction of the 4th generation would be an increase of the Higgs event rate in the WW* channel, and a suppression in the LHC gamma-gamma and the Tevatron bb channels.... which is exactly opposite to the tendencies shown by the current Higgs data. Here also a caveat is in order: new heavy fermions with the quantum numbers of the top, bottom or electron may well exist. However they have to be different from the Standard Model quarks and leptons in that their masses do not originate uniquely from electroweak symmetry breaking; in the technical jargon they have to be vector-like fermions, unlike the chiral fermions in the Standard Model. Invisible Higgs. There are many models predicting the Higgs boson should be invisible at the LHC. It could be truly invisible, that is decaying dominantly into some weakly interacting particles, possibly into the same particles that constitute dark matter. Or it could be even more perverse by decaying dominantly into light quarks or gluons, thus hiding in the overwhelming QCD background. Well, we know now this is not the case as we do see the Higgs... Once more, non-standard Higgs decays are not excluded and it is very important to look for them in the current and future LHC data. But, barring some serious conspiracy, they have to be subleading with respect to the standard decay channels. For example, we already know with some confidence that the invisible branching fraction of the Higgs boson has to be smaller than 50%. Who's next? Of course, we all dream one day the Standard Model will join the above list. If this not the case, the next victim may be the general idea of naturalness. If our world is governed by a natural quantum field theory then there should exist new particles whose role is to balance the quantum effects of the Standard Model particles on the Higgs mass. 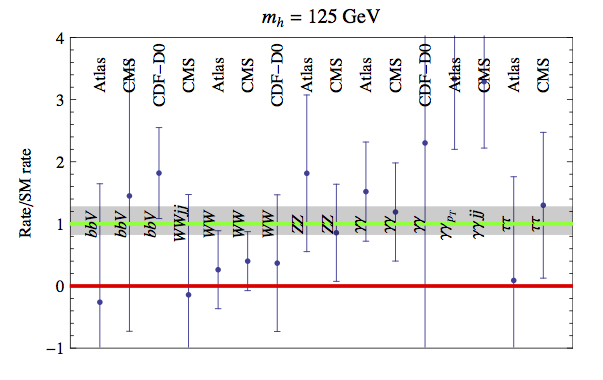 At least the partners of the top quark and electroweak gauge bosons should have masses of few hundred GeV at the most. This prediction will be tested in the year 2012; if nothing is seen by the end of the year we may slowly abandon our concept of naturalness. Dark matter signal in Fermi? Searching for dark matter in cosmic ray experiments is a Sisyphean task. An analogy would be searching for new physics at the LHC without knowing the parton distribution function inside the proton. Indeed, recently we have witnessed several astrophysical excesses (positrons in PAMELA, electrons in Fermi) hailed as "dark matter" by particle theorists and as "pulsars-or-whatever" by astrophysicists, with both sides on an equally firm footing. The feeling is that an unambiguous discovery of dark matter in cosmic rays is impossible, although we may well discover dark matter by other means and then use astrophysics to constrain its properties. There is however one exception from that rule. The lore is that only dark matter can produce a monochromatic photon line; all standard cosmic phenomena we're aware of produce a continuous spectrum of photons that can usually be well approximated by a power law. On the other hand, gamma ray line can be easily produced by annihilation of weak-scale dark matter particles in the galactic center. Today, the average velocity of dark matter particles in our galaxy is about 1/1000 of the speed of light, thus they are practically at rest from the point of view of the relativistic kinematics. If two dark matter particles meet and annihilate into 2 photons (or 1 photon plus 1 other neutral particle) conservation of momentum implies that the energy of the outgoing photons must be equal to the dark matter mass. Therefore an observation of a gamma ray line from the galactic center would be considered a smoking gun signal of dark matter, and as a bonus it would give us an estimate of the mass of the dark matter particle. That sounds too good to be true, and indeed there is a catch. Dark matter is...well... dark, so it does not directly couple to photons. In a generic model of dark matter, the 2-to-2 annihilation into photons is a loop-mediated process whose rate is orders of magnitudes smaller than the annihilation into other Standard Model particles. The latter does not produce a photon line but rather a continuous spectrum (for example, annihilation into electrons would produce photons via a bremsstrahlung off the final state). For this reason, a random model from the zoo, such as Minimal Dark Matter or the MSSM neutralino, cannot predict a gamma-ray line at an observable level, given current constraints on the gamma ray continuum flux. Nevertheless, there exists a handful of models where the 2-to-2 annihilation into photons is enhanced above the naive expectation, and the resulting line is potentially observable, see for example here or here. 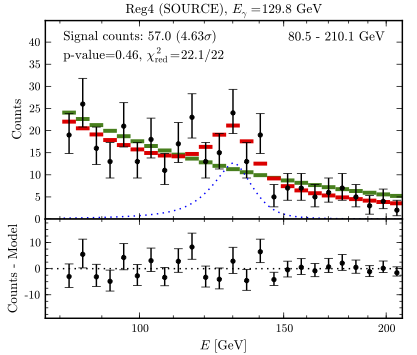 Now, last Friday a new paper appeared on arXiv which claims that a gamma ray line is present in the data collected during the last 4 years by the Fermi satellite! The line can be found by a sophisticated analysis that selects the region of the sky with the optimal signal-to-background ratio depending on the assumed density profile of dark matter. Such an analysis reveals a bump over the gamma ray continuum near 130 GeV. This would correspond to a dark matter particle with the mass of 130±2 GeV annihilating into 2 photons (or a ~145 GeV particle annihilating into γ+Z boson, or a ~155 GeV particle annihilating into γ+Higgs). The local significance of the bump is 4.6 sigma, or 3.3 sigma after the look-elsewhere effect is taken into account. The best fit annihilation cross section is slightly above 10^-27 cm^3/s, which is a typical cross section value for the weak interaction processes, and about 1/10 of the total annihilation cross section expected if dark matter is a thermal relic from the big bang. One should note the analysis has been performed not by the Fermi collaboration but by an outsider. In fact, a similar analysis by Fermi himself found no significant gamma ray line signal (but using less data and less fancy statistical methods). Unlike in particle physics, data collected by astrophysics experiments are often publicly available and can be independently analyzed by anyone with enough skill and will. Of course, an outsider's analysis carries less weight because some relevant information needed to precisely assess systematic errors is known only to the collaboration members. Nevertheless, in the past at least one discovery in the Fermi data was first claimed in an independent analysis and only later confirmed and blessed by the collaboration. In the case at hand, the members of the collaboration admit off the record that the line is indeed present in their data, although with a somewhat smaller statistical significance than claimed in the paper. What is Higgs telling us so far? Contrary to what you might have read in my April Fools post, the Higgs excess at the LHC is not due to a loose cable but is almost certainly a manifestation of the real beast. While experimentalists keep a cautious stance, at least in public, most theorists are already at the next level of cognition. The question being asked is whether the Higgs boson is the one predicted by the Standard Model, or whether the data point to one of its numerous possible realizations beyond the Standard Model. That question of course cannot be yet answered with any decent statistical significance. Nevertheless, theorists are already launching reconnaissance attacks, so as to pass the time until more data arrive. 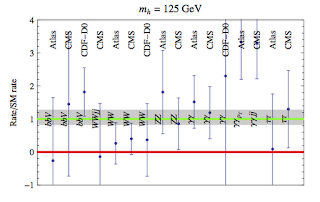 At the moment the most up-to-date analysis is this one collecting 16 measurements from ATLAS, CMS and the Tevatron, and interpreting them in a general framework where the Higgs couplings are allowed to deviate from to the Standard Model predictions. This is of course a simplistic theorist-level analysis that doesn't take into account some relevant pieces of information jealously guarded by the experimental collaborations. However, a good guess is that at this point more sophisticated procedures would give very similar results. The plot here shows the break up of the 125 GeV Higgs signal into the final states analyzed by the experiments. 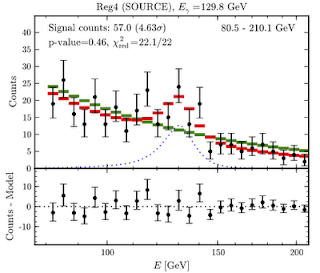 The first thing to observe is that, on average, the production rate is consistent with that predicted by the Standard Model (the green line). Furthermore, one can read off that the the null hypothesis (the red line) is disfavored at the more than 4 sigma level. Thus, black-market combinations confirm that Higgs is practically discovered, which is probably the reason why the LHC is reluctant to release an official one. and likewise the couplings to fermions are allowed to be rescaled by the common factor c. Under this hypothesis the Standard Model point (a=c=1) is far from being the best fit, and the data are better explained when c is smaller than 1. That's because, for c<1, the Higgs production via gluon fusion (which is a loop process dominated by the top quark contribution and therefore it is sensitive to the Higgs coupling to the top quark) is suppressed. This in turn allows one to explain the smaller-than-expected event rate observed in the WW* and ZZ* final states. 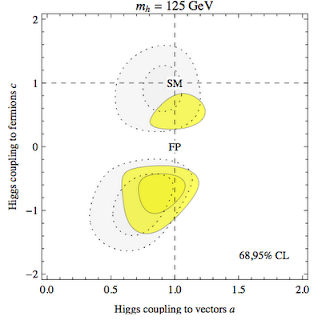 Amusingly, an even better fit is obtained when the sign of the Higgs couplings to fermions is flipped. The reason is that, for c<0, the W and top one-loop contributions to the Higgs decay to photons interfere constructively and, as a consequence the Higgs branching fraction into photons is increased. Incidentally, this plot also shows that the so-called fermiophobic Higgs hypothesis (c=0) does not explain the data well. 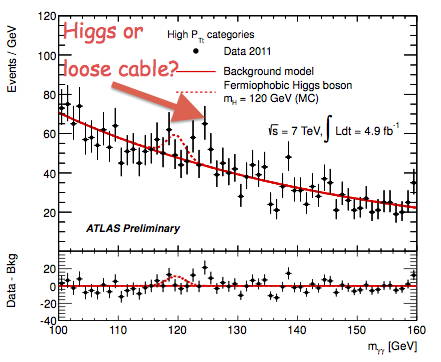 April Fools '12: Higgs or loose cable?! These days CERN is going through turbulent times. Last week a prominent physicist had to quit his post after an embarrassing error was discovered in the neutrino speed measurement by CERN's OPERA experiment. Soon there will be more heads rolling. As soon as it became clear that the apparent superluminal propagation of neutrinos in OPERA was caused by a loose cable, CERN's director general ordered an inspection of all detectors so as to make sure a similar problem is not affecting other experiments. The conclusions of this internal inspection were reported yesterday evening at a closed meeting at CERN. The news reaching me are quite sensational: spokesperson of the ATLAS collaboration admitted that a faulty cable had been identified in their detector; moreover, that issue may have significantly distorted the results of the Higgs boson searches! From what I could gather, the issue is with a cable connecting two modules of the electromagnetic calorimeter. It was discovered that this particular cable had a short-circuit, as a result of which it was repeatedly sending pulses with similar characteristics as those expected from a 125 GeV Higgs boson decaying to a pair of photons. Recall that the tantalizing hints of the Higgs boson reported last year by the ATLAS and CMS collaborations were almost entirely based on the observations of a bump in the diphoton mass spectrum, see the graph on the right. It now appears that at least a part of that bump can be blamed on the loose cable. Meanwhile, the CMS collaboration also reported a problem yesterday. From what I could understand, in this case it is not a hardware problem but a software bug originating due to the American and European parts of CMS using different units of mass (kilograms vs pounds). It is not yet clear if this issue affects the Higgs searches, but it is not unlikely that, when the data analysis is corrected, the bump in the diphoton spectrum will shift to a different location or completely disappear. 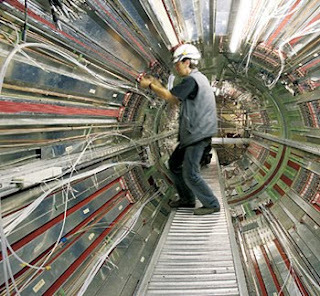 In the end, it is probable that the Higgs searches at the LHC will have to be redone from scratch during the 2012 run. In that case the LHC may lose its place in the queue, and the glory may go to the Tevatron who recently reported a signal of the Higgs boson decaying to a pair of bottom quarks. An official statement from CERN is expected on Monday morning. Stay tuned as the story unfolds. OPERA is not a CERN experiment, CERN only provides the neutrino beam for that collaboration (although, because of some awkward politics, CERN assumed in the eyes of the world a certain moral responsibility for OPERA). There's no way a loose cable can fake the Higgs signal; thousands things can but not this one. On both sides of the Atlantic the elementary particle masses are measured in GeV.